Living in San Francisco, it often seems like a new crane goes up for a major project every week. But many more huge projects are still on the horizon. We’ve taken a look at some of the megaprojects slated to transform the cityscape and ranked them by how many acres they cover. These major developments have earned their “mega” moniker. They include millions of square feet of residential, office and retail development, some in sprawling new neighborhoods and others in soaring towers. The developers bringing big changes to the city include Forest City, Oceanwide Holding’s Tohigh Investments, Kilroy Realty Corp. (NYSE: KRC), Lennar Urban and others. 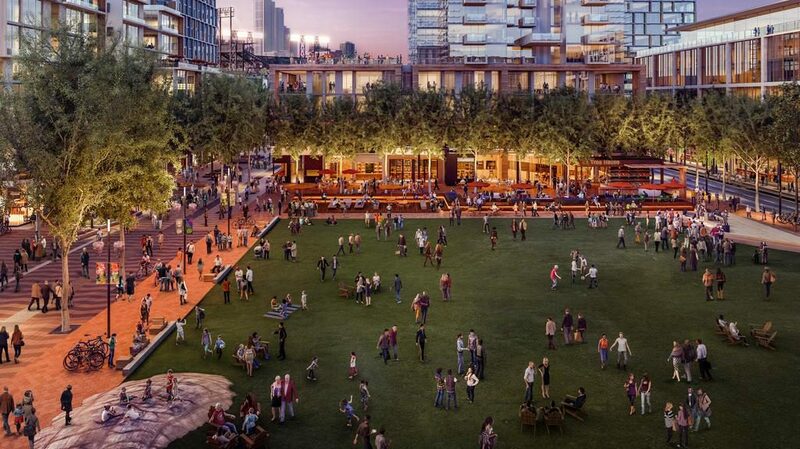 The San Francisco Giants are even getting in on the action, fielding a massive project across the streets from AT&T Park – you can read more about that in our slideshow. The Candlestick Point development is transforming the former football stadium into a thriving community of more than 25,000 residents in San Francisco’s long-neglected southeast corner. 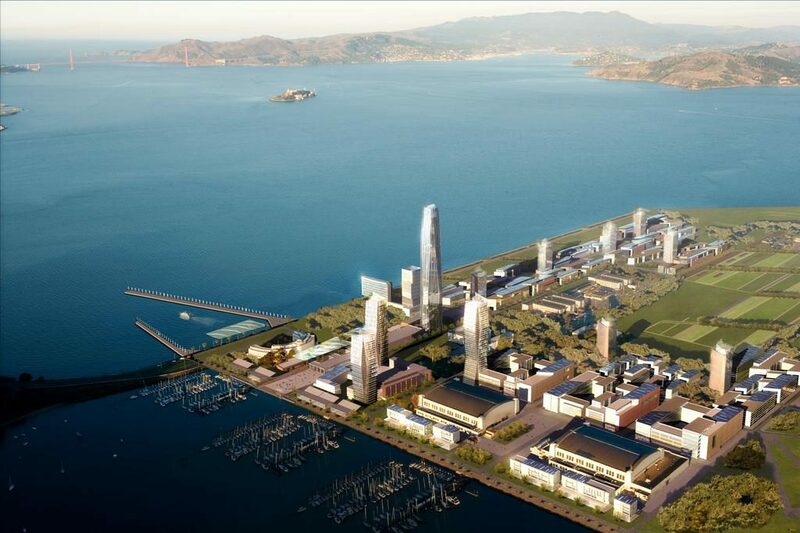 A rendering of what the 758-acre Shipyard will look like once the entire project is built out. The project has been a decades-long effort. In 1999, the city selected Lennar as the master developer. Lennar plans to transform the polluted former naval base, which is next to the low-income Bayview neighborhood, into the city’s new development frontier (pictured). The federal EB-5 program, which allowed foreign investors to pay $500,000 each in exchange for a U.S. Green Card has proved a vital part of the financing of the San Francisco Shipyard development. The program raised nearly $250 million for the project as of July 2015, and the company hopes to nearly double the figure in 2016-2017. The development plans for Candlestick Point include more than $14 million in community benefits and include the rebuild of the 256-unit Alice Griffith public housing complex into a mixed-income development. Size: 775 acres total. The entire development envisions 12,000 homes, with nearly one in three affordable, 3 million square feet of offices and 350 acres of open space. 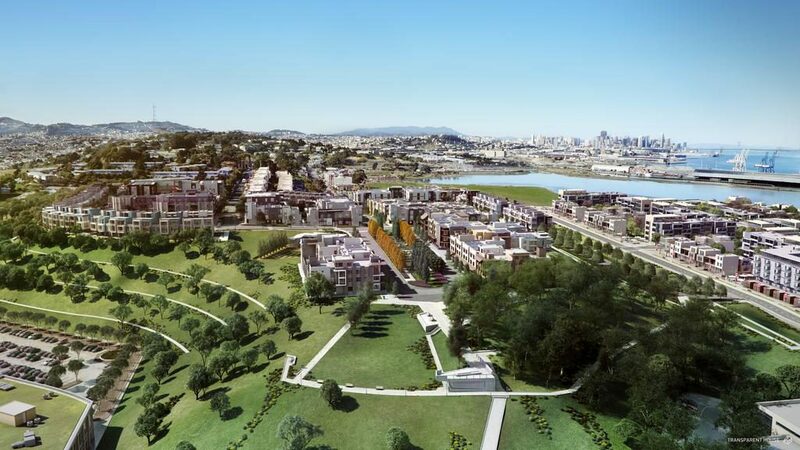 At Candlestick Point, the first phase includes 2,214 housing units, more than 1 million square feet of commercial space and 9 acres of parks and open space. 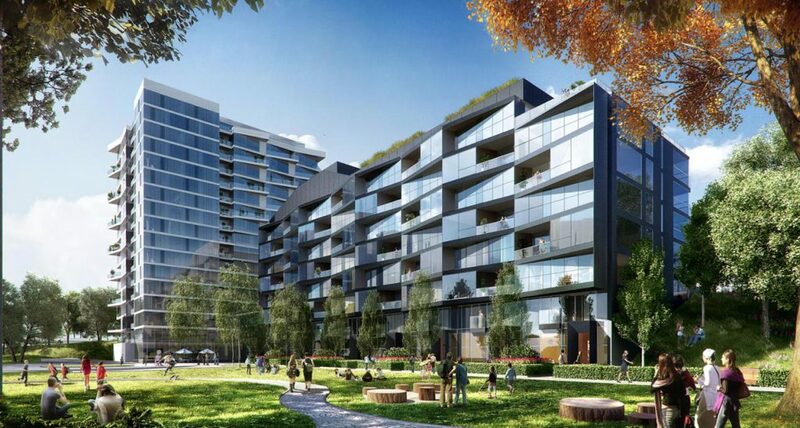 A rendering shows 1188 and 1198 Junipero Blvd, designed by Kwen Henmi. These 17-story and 8-story buildings on the southeast portion of Parkmerced will include 266 units. The first phase to be built will be five residential complexes adding about 1,000 units to the development. The development is in the far southwestern part of the city, near San Francisco State University and the Daly City border, an area that has seen little new residential construction. Parkmerced was originally approved for redevelopment in 2011, but was hung up in court. 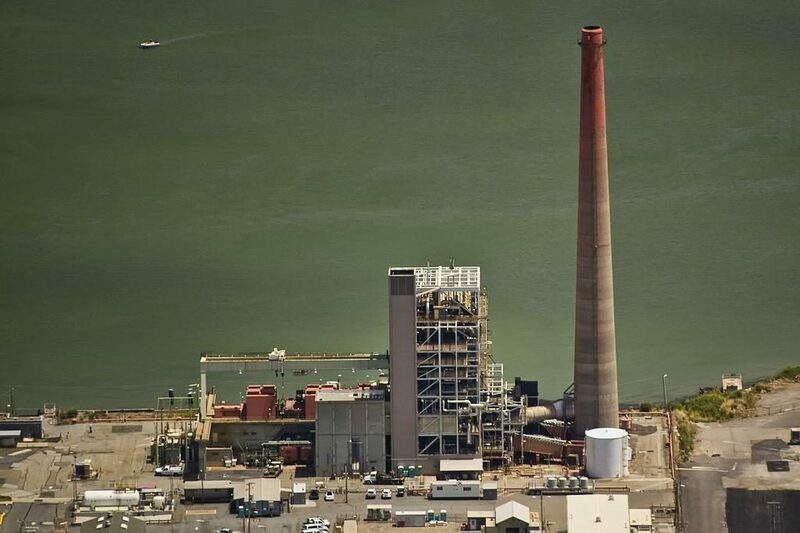 It prevailed in a lawsuit that challenged the project’s environmental viability in 2014. Parkmerced must replace all 1,538 existing rent-controlled units on-site and each new phase will include 15 percent of the units as below-market-rate. The developer must also design and build the re-routed M-line Muni streetcar to go through the project site. Size: 5,679 new housing units on 152 acres. Developer: Parkmerced Investors LLC, led by New York developer Mark Karasick. After years of legal wrangling, the project is finally underway to bring thousands of housing units and jobs to the two underutilized islands. The environmental lawsuit that iced the project for years is finally resolved and the U.S. Navy, which operated a station there until it closed in 1997, is cleaning up land and transferring it to the city. A ferry terminal connecting the project is planned, as well as 300 total acres of parks and open spaces. All of the 8,000 housing units are expected to be built out over the next 10 to 15 years, and 25 percent of them will be affordable. The project will also include 140,000 square feet of retail and commercial space and 100,000 square feet of office space. Critics of the development are concerned over its effects on the already-crowded Bay Bridge, among other issues. Size: 8,000 residential units planned on around 45 acres on Treasure Island’s western shoreline and the 80-acre Yerba Buena Island. Developer: A partnership of Lennar Urban, Kenwood Investments, Stockbridge Capital Group and Wilson Meany. Orton Development is currently restoring eight historic buildings along 20th Street. 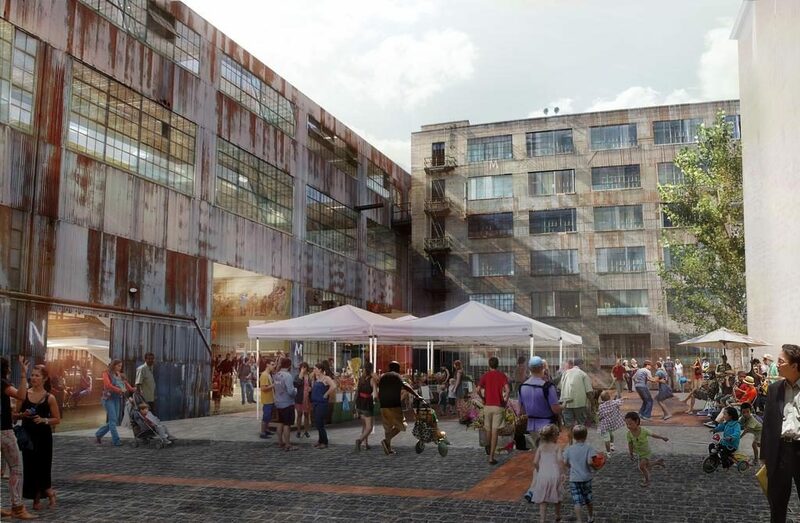 The project will open up a stretch of the waterfront near Illinois and 22nd streets in the Dogpatch neighborhood to the public while also creating much-needed housing and office space. The project includes between 1 million and 2 million square feet of commercial office, between 1,100 and 2,150 residential units with 30 percent affordable units, about 450,000 square feet of retail, light industrial and arts space, 9 acres of waterfront parks, and rehabilitated historic buildings. 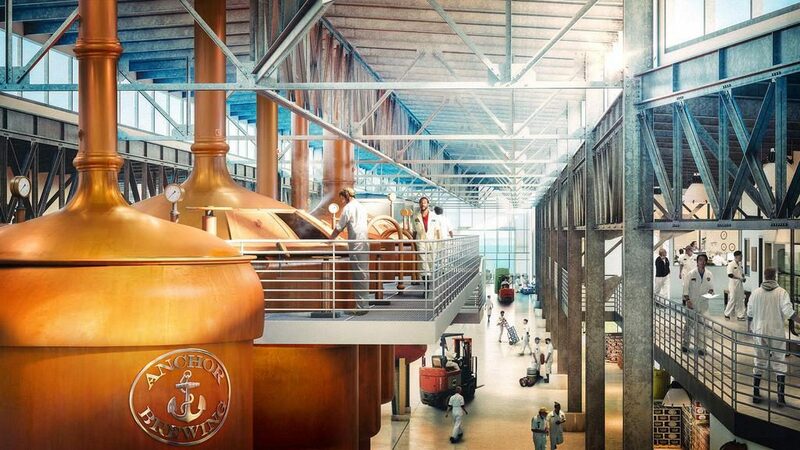 Anchor tenant: Around Anchor Steam’s new brewery, the Giants plan to make room for smaller manufacturers. 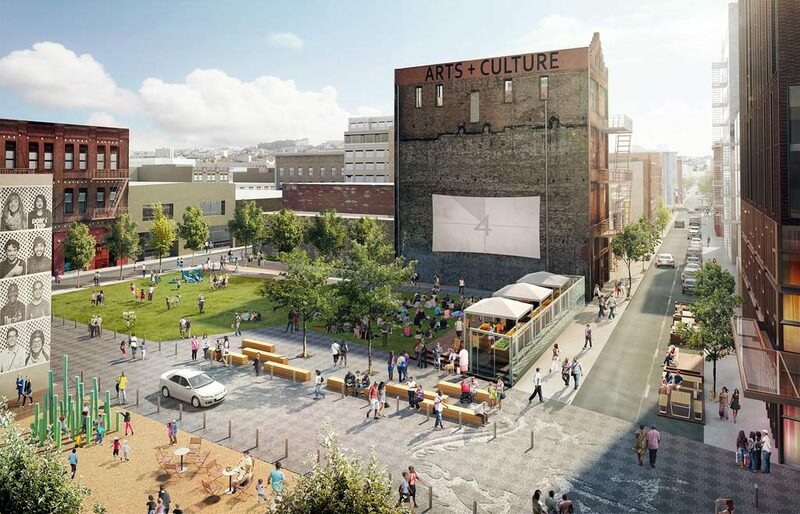 The Mission Rock project’s “Market Square” will sit in the middle of office and apartment towers. 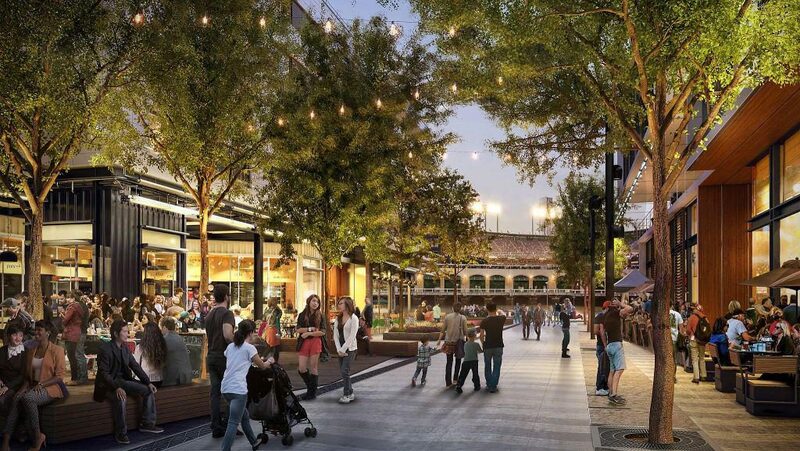 For eight years, the San Francisco Giants have been working to develop the land across from AT&T Park for housing, office, retail and parks. The team won the rights to develop Mission Rock in 2009 and then sat tight as the economy recovered. In the last election, San Francisco voters approved the Giants’ plan to increase building heights, giving the team a crucial win. 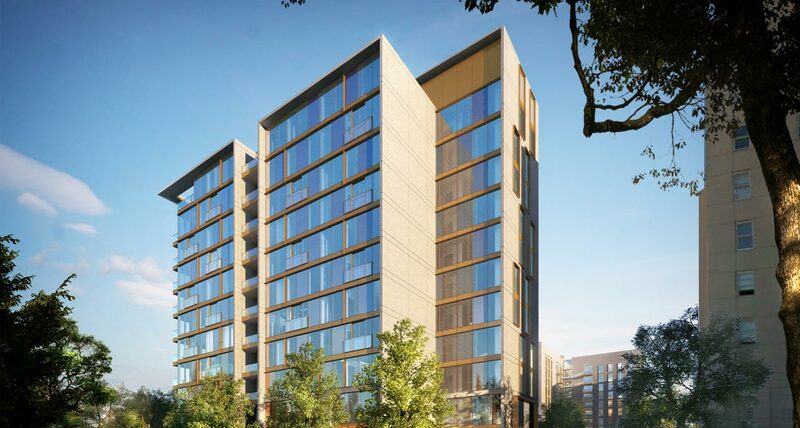 The development will include approximately 1,500 apartments, with 40 percent of those units for low- to middle-income families and approximately 1.3 million square feet of office space, retail and parks. Developer: The San Francisco Giants. 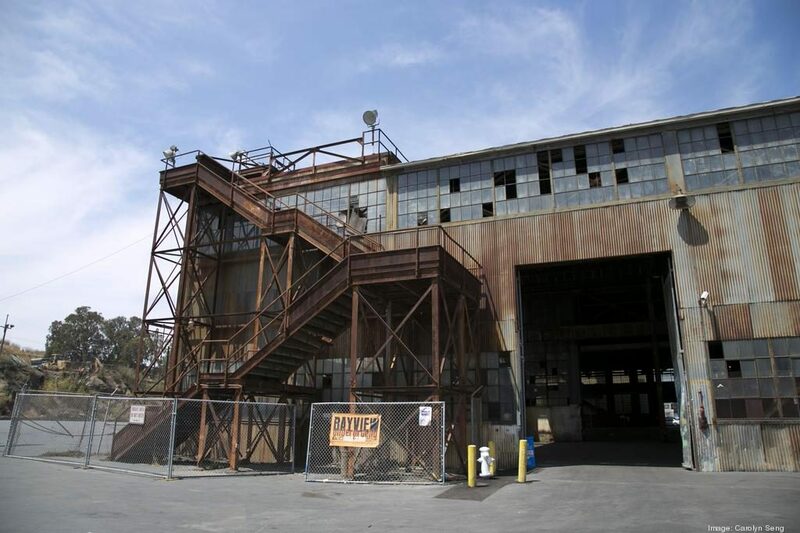 With its location near San Francisco’s Pier 70 and India Basin developments, the scarred 21-acre site of the closed Potrero Power Plant is a hot development property. District Development is now talking to neighborhood groups as the next step in entitling the site for about 3 million square feet of mixed-use space. Residential development had been banned by former owner PG&E on the site when it traded hands, but PG&E removed the ban. Size: About 3 million square feet of residential, retail, industrial and office space on 21 acres. The project includes 2.1 million square feet of offices, retail and restaurant space, plus 115,000 square feet of modern warehouse and 10,000 square feet of shop space for the rebuilt San Francisco Flower Mart. The proposed, 7.5-acre project is one of the best situated in San Francisco’s pipeline. It will sit a block west of the under-construction Central Subway’s only ground-level station, at Brannan and 4th streets. It’s also in the heart of tech-heavy SoMa. 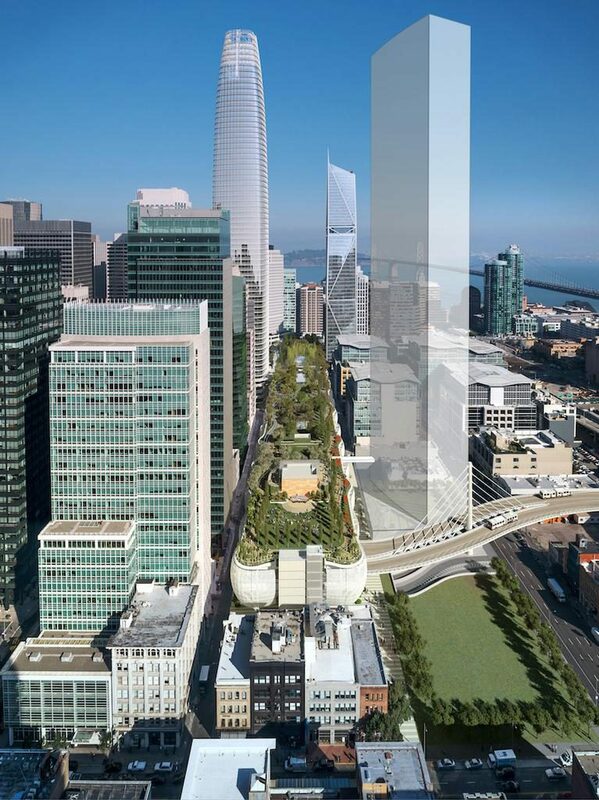 Once built, the Flower Mart will be second in size only to San Francisco’s Embarcadero Center. After much political debate about the future of the Flower Mart, developer Kilroy has promised to spend $80 million to build a new flower market, securing hundreds of jobs. 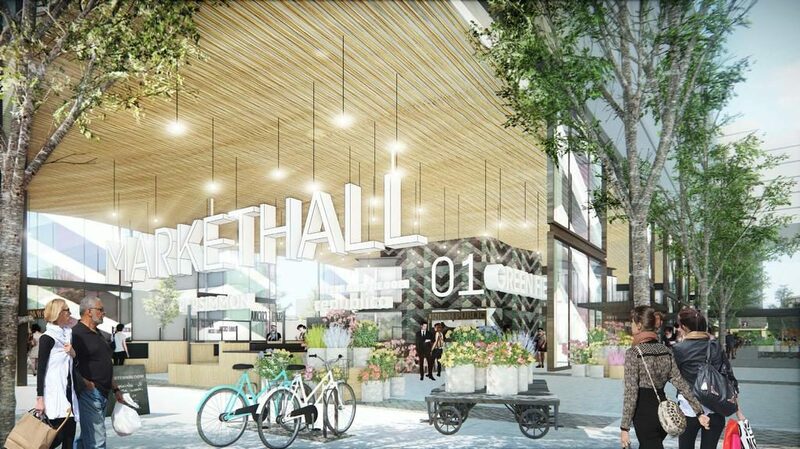 Size: 2.1 million square feet of offices, retail and restaurant space, plus 115,000 square feet of modern warehouse and 10,000 square feet of shop space for the rebuilt San Francisco Flower Mart. 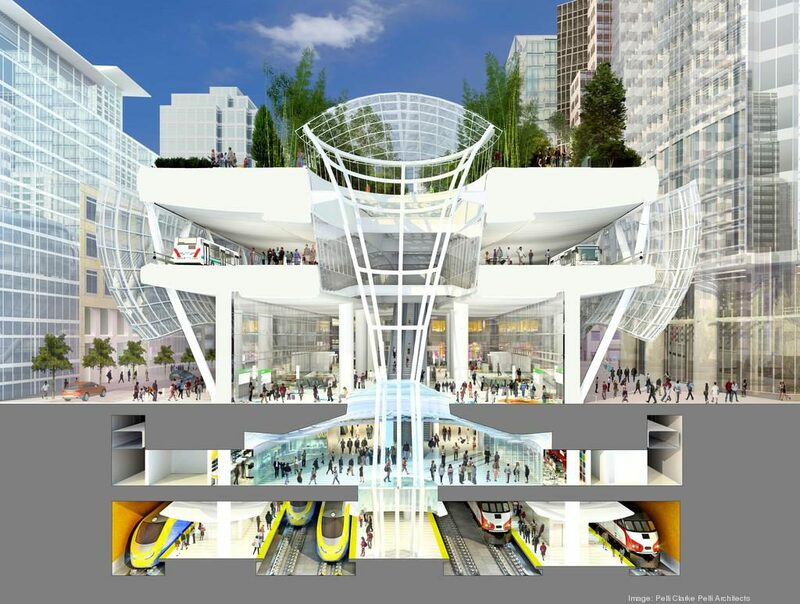 The Transbay Transit Center is at the heart of the Transbay Development Area, a 40-acre development area full of large projects. The city’s tallest skyscraper, Salesforce Tower, is under construction and set to open in 2018, as well as projects including 181 Fremont St. and Park Tower at Transbay Block 5 are also rising. This is one slice of the 5M project, where an affordable arts building will stand above a public park. After months of contention over affordable housing policies and gentrification fears, 5M cleared the city’s Board of Supervisors in November. The 4-acre development at Fifth and Mission promises to transform the area with a three-tower complex offering office, residential and retail space. 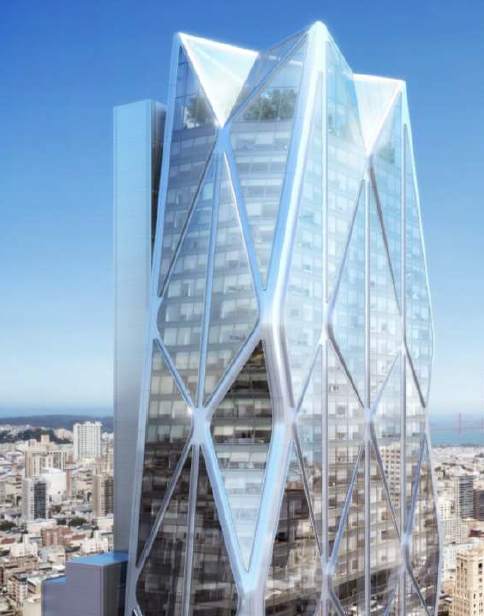 Forest City and partner Hearst Corp. (which owns the Chronicle Building) agreed to increase the amount of affordable housing, while providing open space and money for local nonprofits. Size: 688 residential units (241 affordable), 807,600 square feet of new and renovated office space, 50,000 square feet of new public open space, and 35,000 square feet of retail and other ground-floor uses. 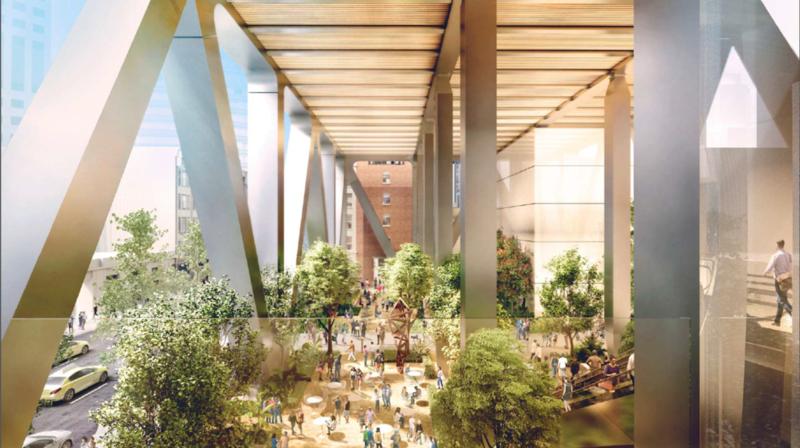 The project also includes a half-acre of open space with an “urban room” and will preserve two of the existing low-rise buildings, which will provide “open space relief” from the spires of the Transbay District. “The center of the diamond” is what TMG Partners CEO Michael Covarrubias called this multi-faceted project in the Transbay District after selling it to Tohigh in 2015. The land itself was a rare jewel, already zoned for 2 million square feet of development, and the taller tower’s design features a diamond-filled form. Its developer, Chinese giant Oceanwide, is taking a primary role on approvals. The 910-foot tower facing First Street will have 1 million square feet of office space and 109 units of housing. 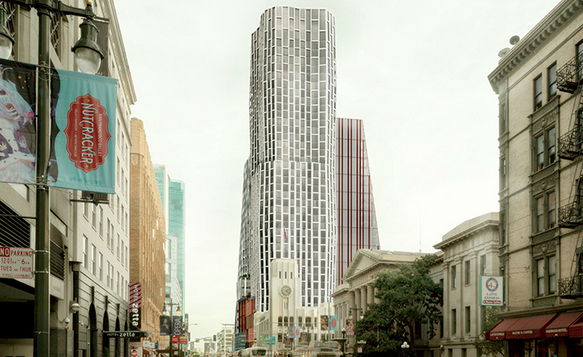 The 600-foot tower on Mission Street calls for a 169-room hotel topped by 156 residential units. Location: First and Mission streets. Cost: More than $1.6 billion. Developer: Oceanwide Holding’s Tohigh Investments. 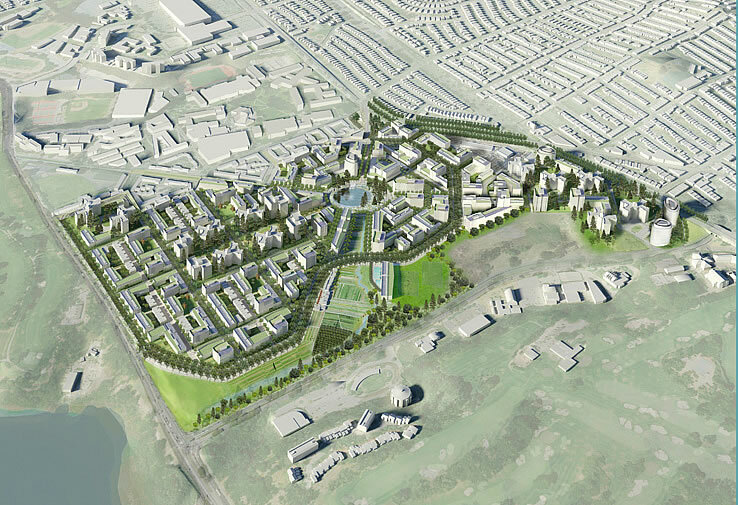 To bring Whole Living to Parkmerced, a vibrant neighborhood for our residents and the community, using smart design and planning to reduce Parkmerced and San Francisco's impact on the environment. To protect our residents and provide any who live in apartments slated for replacement with new onsite apartments at the same rent-controlled rate.